A large size Victorian pique work cross necklace, circa 1870. Piqué is an English decorative jewelry technique, in which gold or silver are inlaid into a material to form a pattern. Materials commonly used for piqué work included, tortoiseshell, black Vauxhall glass (French Jet) Whitby jet and horn. This cross is rendered in Vauxhall glass with gold inlay in a pretty floral pattern. The top has a brass pinch bail and suspension ring and it is still attached to a black and gold grosgrain ribbon that looks to be original to the piece. This cross was likely worn as mourning dress. 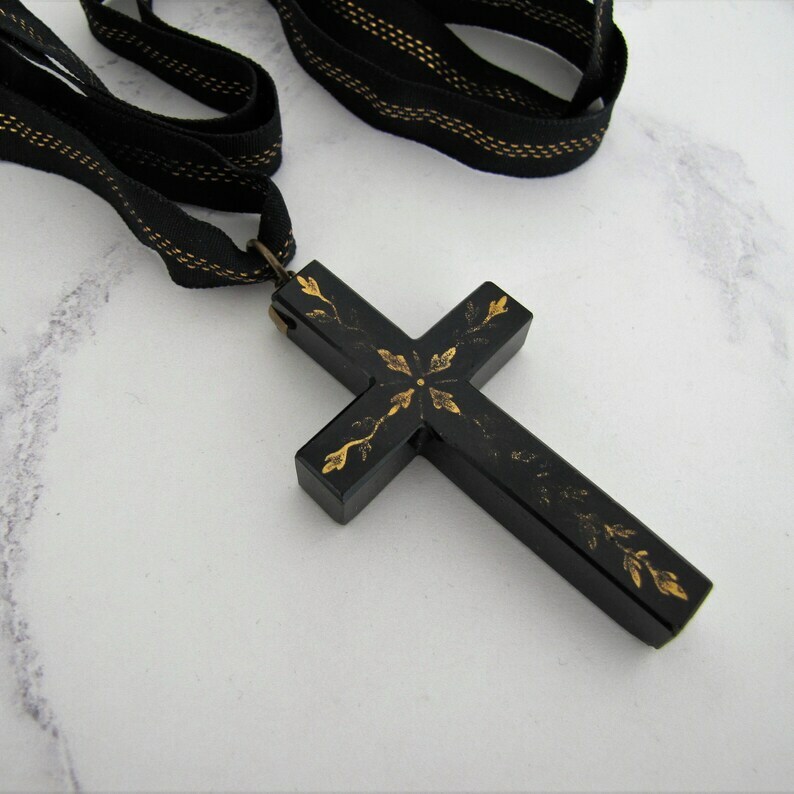 CONDITION: The cross is in very good antique condition given age, the gold pique inlay is a little worn but the pattern is still pretty much intact and identifiable, There are tiny nibbles to the edges of the glass in places that are only apparent under magnification. The pinch bale and suspension ring are heavy duty and solidly attached to safely support the weight of the cross. The ribbon is in remarkable condition given age! Gorgeous Victorian era mourning jewel, very wearable today and will invite plenty of compliments! Browse more exceptional fine and costume jewelry from every era - Georgian - Victorian - Edwardian - Art Deco - Modern - at mercymadge.etsy.com - With new arrivals added to our shop daily we offer an interest free layaway plan as well as a no risk guarantee. Our standard shipping includes tracking for your peace of mind. Your purchase will arrive gift wrapped in a Mercy Madge box, perfect for giving or safekeeping! Georgian Hair Bracelet. 14K Rose Gold Locket Bracelet, Vauxhall Glass Hair Compartment. Antique Sentimental Mourning Victorian Bracelet. Antique Whitby Jet Pendant Necklace, Carved Pineapple. English Jet Victorian Necklace. Victorian Mourning Pendant On Silver Chain. I couldn’t be happier with my fob pendant. It is even more beautiful in person. And my transaction with this shop was flawless! I would absolutely shop here again. Thanks so much for a wonderful experience. Victorian Whitby Jet Watch Chain Mourning Necklace. Antique Carved English Jet Pocket Watch Chatelaine Chain. Graduated Jet Collar Necklace. Victorian Mourning Cross Pendant. Black Vulcanite Rose Cross On Silver Chain. Antique Gutta Percha Cross Necklace.